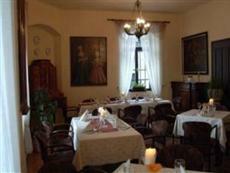 Discover all that Kutna Hora has to offer with Hotel U Ruze as a base. The Hotel U Ruze boasts a convenient location with modern amenities in every guestroom and superb service. Each guestroom is tastefully appointed with television, separate shower and tub, mini bar. Hotel facilities offered at this Kutna Hora accommodation include 24hr room service, shops, restaurant, room service, hotel/airport transfer, business center. The hotel offers massage, water sports (non-motorized), garden to provide extra pleasure and relaxation for all guests. This hotel is characterized by a combination of modern comfort and traditional element of Kutna Hora, making it a distinct accommodation. For your reservation at the Hotel U Ruze Kutna Hora, please enter your preferred visit dates and follow our secure online booking form.